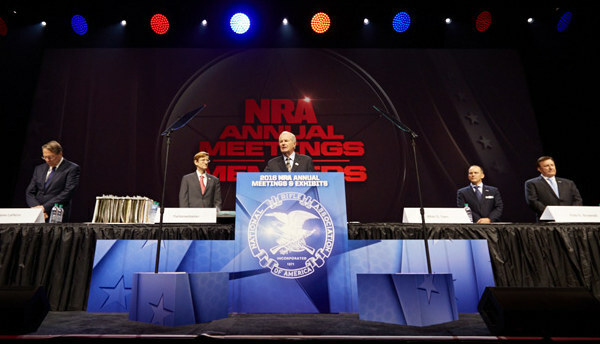 President Donald Trump will address NRA members at the NRA-ILA Leadership Forum on Friday, April 26, 2019 in Indianapolis, Indiana. This is the third consecutive year that President Trump will deliver the keynote address at the Leadership Forum. 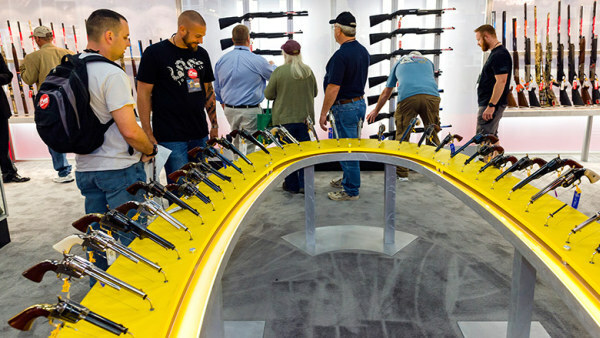 This is part of the NRA Annual Meetings & Exhibits, which runs April 23-27 at the Indiana Convention Center in Indianapolis. In this essay from The Shooting Wire, Tom Gresham states that the anti-gun left seeks nothing less than the eventual confiscation and destruction of all privately-held firearms. The anti-gunners have revealed their goals, says Gresham, through radical legislation recently introduced in Congress, and suggestions that an Executive Order by a future by a Democratic Party President could halt ALL gun sales. Gresham says gun owners must wake up, and take action NOW. Otherwise our rights will be lost. We think every gun owner should read this. Sometimes understanding what’s going on requires us to connect the dots on things that don’t immediately appear to be connected. Looking at recent events, it’s now possible to see the plans of the gun banners. It’s much worse than almost anyone imagined. H.R. 8, a bill in the House, would end the private sales of guns, would end being able to give a gun to someone, and would criminalize even loaning a gun to someone — unless you got the permission of the FBI each time you want to buy, sell, loan, or borrow a gun. In other words, there could be no legal transfer of a gun in the U.S. unless the government approves each transaction. House Speaker Nancy Pelosi threatened that a Democrat President could declare a national emergency on gun violence. Pelosi’s threat didn’t just pop into her head. This idea has been in the works. The expanded background check provision requires that all gun sales, and gifts, and loans — any transfers — must go through the FBI NICS system. H.R. 1112 would kill the protection of allowing retailers to sell guns when they don’t get a “denial” from the FBI in three days. If those two provisions were in place I fully expect a Democrat president to act after a highly-publicized shooting to declare a national emergency and shut down the NICS checks for 90 to 120 days. Maybe even a year. That would be so that we could have a “national conversation” about gun violence. America’s gun owners would suffer a “mere inconvenience” the banners will say. Except that most privately-owned gun stores could not survive three or four months with no gun sales. The gun ban lobby is not dumb. 1. Kill off all private sales, forcing all legal gun sales to go though dealers. 2. Kill the provision in current law which protect gun owners from a government shutdown of the background check system. 3. Declare a National Emergency and close background checks, which stops all legal gun sales. Make no mistake. This is part of the larger plan to confiscate (“mandatory buy-back”) your guns. Naturally, there would be legal challenges. The current makeup of the Supreme Court favors — ever so slightly — the hope that the high court would stop such a thing. If it took months to work its way through the courts, however, massive damage would be done. Thousands of businesses would close and tens or hundreds of thousands of people would be thrown out of work. Naturally, to the “if it saves one life” crowd, that’s a price they are willing to pay. Well, they wouldn’t pay it. We will. And that doesn’t even touch on the subject that no one wants to talk about … [resistance]. We stop it the old fashioned way. We beat it at the polls. We beat it by speaking up in our churches. We beat it with peaceful activism in the streets. We join every single gun rights group — even those which less “pure” by whatever standard is in vogue on any given day. We spend money. A lot of money. We stop complaining about requests for donations. We donate annually an amount equal to the price of a new gun. How about a dollar a day? We actually do call the offices of our Congressional representatives monthly and talk politely with the staff there about our concerns on Second Amendment matters. We volunteer on campaigns. We go to school board, city council, and state legislature meetings and hearings. We show up. First, you have to look in the mirror and admit you haven’t done enough/much/anything. No one else can do this. Each of us must have the conversation with ourselves and take an honest look at what we have and have not done. And what we can do. This is a total lifestyle change. It’s a change in where you spend your money and your time. Second, each of us has to bring along a friend into this activism. 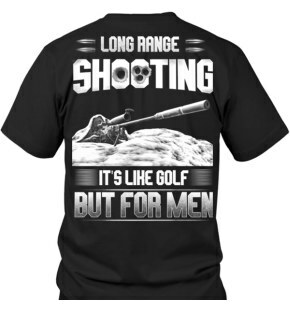 I’m not talking about taking someone to the range, though that’s always worthwhile. I’m talking about convincing or more friends that each of you really must donate a buck a day. A lot of dough? Less than many of us spend on coffee. Times a million gun owners. We win or we lose right here. Right now. The solution is as close as your mirror. Share the post "The Threat of Gun Confiscation — Tom Gresham Says “Wake UP”"
Marlin 1895 Background image from Sportsmans Arms, Petaluma, CA. This new legislation would essentially require that ALL gun sales, even between private parties, be subject to Federal NICS background checks. 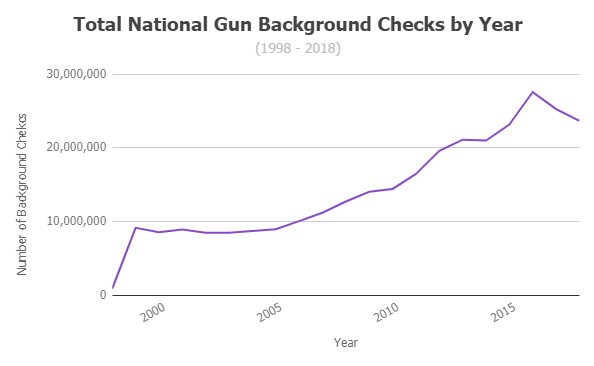 * On the surface, this seems to have some appeal, but there is little convincing evidence that such legislation will produce a meaningful reduction in gun violence. Why? Criminals obtain guns illegally (though theft and the black market), and nearly all the mass shooters in recent years have used weapons that were obtained legally, AFTER the perpetrators had passed normal FBI background checks. * Some states, such as California, already require background checks, made through an FFL, for private-party transfers. But in many other states, a private party can still sell a firearm to another private party, provided there is compliance with applicable state and local laws. 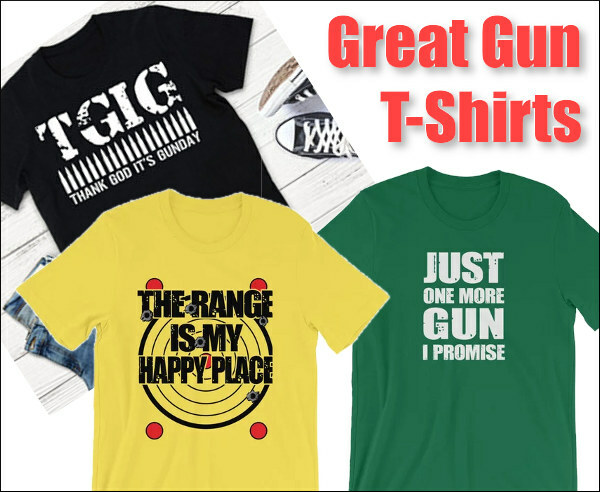 Share the post "Universal Background Check Legislation Introduced in Congress"
Some of our Shooters’ Forum members have asked for t-shirts with AccurateShooter.com logos. 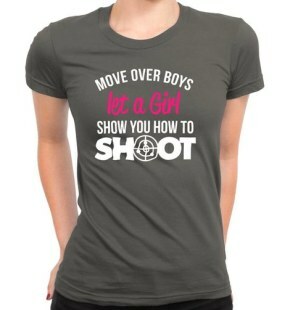 Sorry folks, we don’t offer those for sale, but we have searched the internet and found ten great t-shirts for gun guys and gun gals. 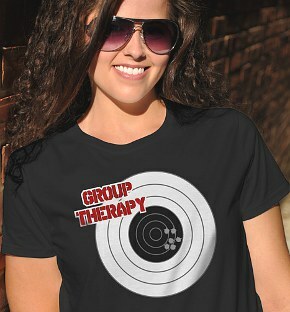 Most of these shirts are available is multiple sizes, and many offer color choices. 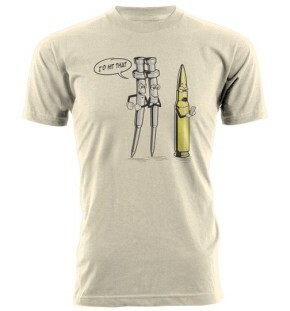 You’ll find over 100 more gun-themed shirts at the Etsy.com online store. This may offend your golfing buddies. Beware the gal wearing pink. 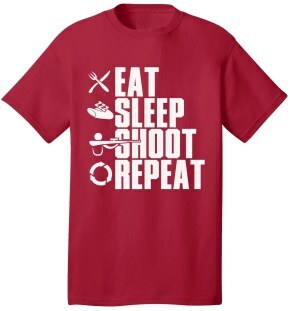 Daily routine of dedicated shooters. Two Firing Pins say “I’d hit that”. Look carefully, that’s not a steer’s skull. This is certain to annoy Starbucks liberals. 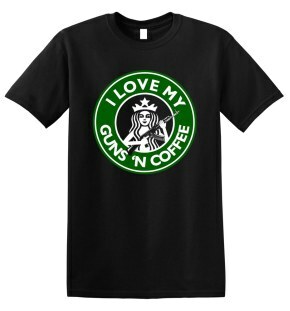 Share the post "Firearms Fashion — T-Shirts for Gun Guys and Gals"
Friday was a notable day for the NRA, with the President of the United States, Donald Trump, addressing the faithful at the NRA-ILA Forum. Trump gave a stirring speech in Dallas, renewing his administration’s commitment to the Second Amendment and the rights of law-abiding citizens to own firearms. 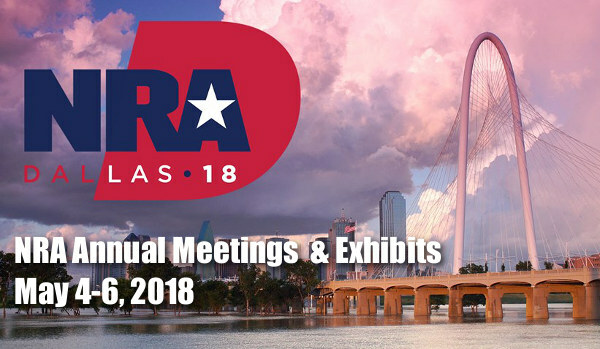 This morning the major event of the NRA Annual Meetings and Exhibits (NRAAM) takes place — the Annual Meeting of Members at 10:00 am Central Time in Ballroom A of the Kay Bailey Hutchison Convention Center. After that, there is a very full schedule of events, seminars, and celebrity appearances all day. This evening there is a big concert, featuring Travis Tritt and the Gatlin Brothers. 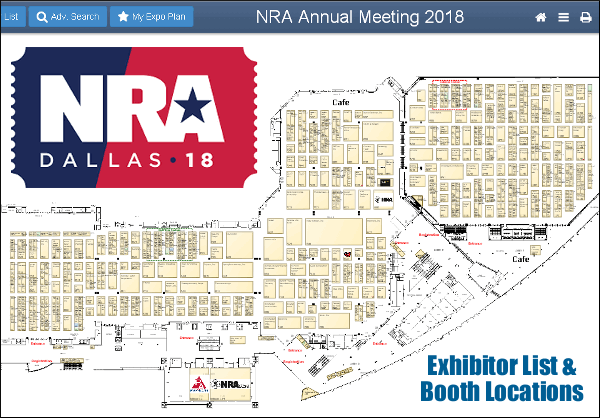 For the full schedule of events, visit www.NRAAM.org. Honoring Charlie Daniels with Guests Travis Tritt and the Gatlin Brothers. 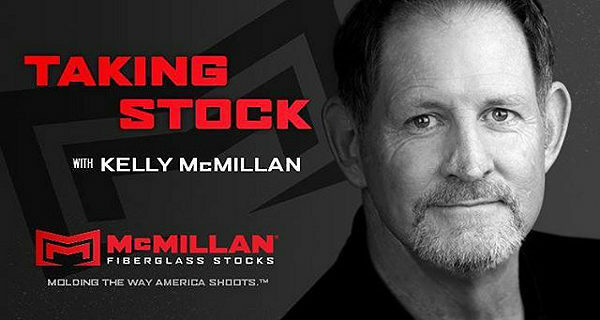 The main action is in the Exhibit Hall — with over 800 exhibitors including big companies like Ruger, Smith & Wesson, and Remington. If you thought yesterday had a jam-packed schedule, check out what’s going on today at the NRA Annual Meetings and Exhibits The show opens at 9 a.m. and there’s plenty more to do and explore! Don’t forget to download the show’s MOBILE APP to have everything accessible at your fingertips. 2:00pm – 3:15pm, Room C141, 143, & 149 – Survival Mindset: Are You Prepared? CLICK HERE for a complete list of seminars, workshops, and special presentations!. CLICK HERE for a complete list of celebrity appearances. Share the post "NRA Annual Meetings — Full Schedule for Saturday, May 5"
BREAKING NEWS (6:13 pm, 6/29/17) — Federal Court grants Preliminary Injunction. Attorneys for the California Rifle & Pistol Association (CRPA), supported by the NRA, obtained an injunction in the case of Duncan v. Becerra, a federal lawsuit[.] 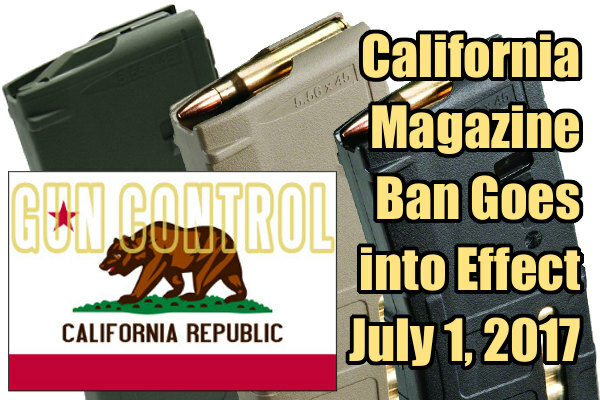 The injunction prevents California from enforcing new laws prohibiting possession of magazines capable of holding more than ten rounds, while the case is pending. The ban was set to take effect on July 1, 2017. In granting the injunction, Judge Benitez held that Plaintiffs are likely to succeed in this lawsuit because “public safety interest may not eviscerate the Second Amendment”. The Order Granting Preliminary Injunction preserves the “status quo” while the constitutionality of the law is decided by the Court. Here is a very important notice for our readers in California. As of July 1, 2017 it will be illegal to own ANY firearm magazine that holds more than 10 cartridges or rounds. 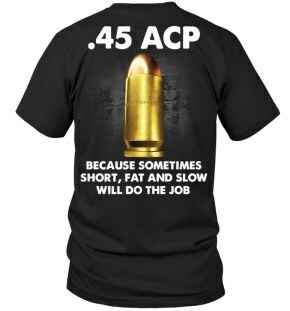 It does not matter if the “full-capacity” magazines were acquired legally. There is NO Grandfather provision. Mere possession will become illegal. Counting today, June 28th, you have just three (3) more days to destroy your 10+ round magazines, render them permanently inoperable, sell them to a licensed dealer, surrender them to a law enforcement agency, or ship them out of California. The July 1st magazine ban is the result of a patchwork of new laws passed by the California Legislature as well as Proposition 63, a deceptively-promoted initiative approved by voters last November. There are lawsuits currently challenging the magazine ban. It is possible that a temporary injunction halting the effect of the magazine ban might be ordered by a court in the “eleventh hour”. But don’t count on it — in a related case, a federal judge in Sacramento recently denied an injunction. Bottom line: if you reside in California and own/possess ANY mags that hold more than ten rounds, you need to find a solution… and find it fast. In conservative, pro-gun Redding this week, Shasta County Sheriff Tom Bosenko joked that gun owners were lining the block to hand their magazines in to the sheriff’s office (In reality, no one has turned one in). He said his deputies won’t be aggressively hunting for large-capacity magazines starting next month. It has been illegal to purchase magazines with 10+ capacity for quite some time in California. However, it remained completely legal to possess and use such magazines which were lawfully obtained before the magazine-capacity limits were imposed in the year 2000: “California banned the sale of high-capacity detachable magazines in 2000, but it remained legal to possess them, except in cities such as San Francisco, Oakland, Los Angeles and Sunnyvale that enacted local bans. That changed this fall when voters and lawmakers passed overlapping gun laws that require Californians, with limited exceptions, to give up any magazine capable of holding more than 10 rounds.” Source: Sacramento Bee. Is the Mag Ban an Unconstitutional “Taking”? Because the new magazine laws provide no compensation to mag owners for what is effectively the confiscation of their property, it can be argued that California’s magazine ban is an unconstitutional “taking” depriving citizens of their property without due process. This is one of the arguments that is being used in court by the NRA and other gun rights organizations challenging the controversial magazine ban which goes into effect July 1, 2017. 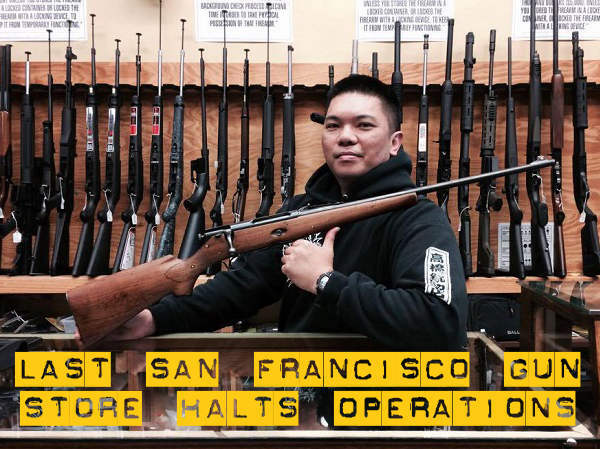 Share the post "Warning to Californians — Magazine Ban Takes Effect July 1st"
Indiana attorney Brian Ciyou has created an outstanding resource, Gun Laws by State (2017 Ed.) (GLBS), that explains firearms laws in all 50 states. 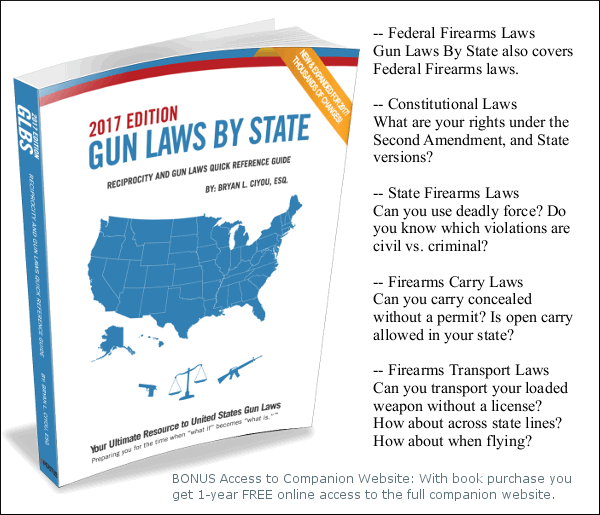 Ciyou’s gun law treatise, available in both book and online (web) formats, covers state laws as well as key federal laws that apply in federal buildings, airports, National Parks, and school zones. There is a handy Reciprocity Map showing which states recognize concealed weapon permits issued in other jurisdictions. 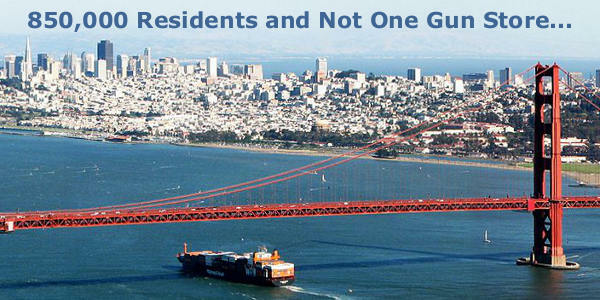 Moreover, GLBS covers Reciprocal Carry for all 50 states, Constitutional Law, Federal Statutory Law, Use of Force, Criminal Provisions, Civil and Criminal Liability, Preemption, Federal Property Rules, and Interstate Transportation. The web version of Gun Laws by State is updated regularly, and Ciyou even provides a GLBS Gun Laws Blog with current topics on gun regulations nationwide. Access key state and Federal legal information for FREE on the GLBS website. Simply click on an interactive map to quickly review gun laws in any state (See Texas example at right). Other Navigation links provide quick access to particular topics, such as rules for Airline Travel, Amtrak, National Parks, and Federal properties. We recommend that readers bookmark the GLBS website. Though much free info is available, you should definitely consider buying the book if you frequently travel with firearms outside your home state. The printed book version costs $20.00, while a digital eBook is $10.00 (or get both for $25.00). CLICK HERE to purchase Gun Law Books and/or eBooks. Share the post "Know Your Rights — Get Info on Gun Laws in All 50 States"
One week after the November Election, Henry Repeating Arms and the NRA pulled off a remarkable display of support for the Second Amendment at the Ben Avery Shooting Facility in Phoenix, Arizona. On Monday, November 14th, 1000 proud shooters from 16 states stood side-by-side in a line spanning a mile and a half long. 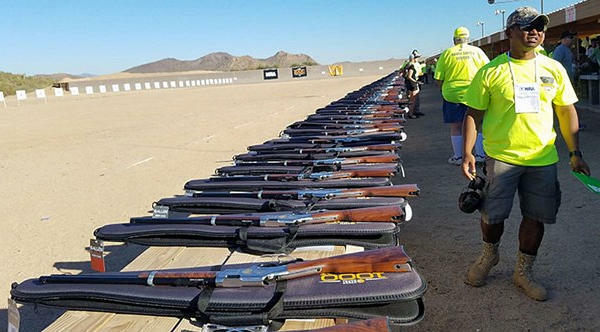 Under the supervision of NRA Rangemasters, the 1000 shooters simultaneously fired two shots from Henry Silver Boy .22 LR lever-action rifles. 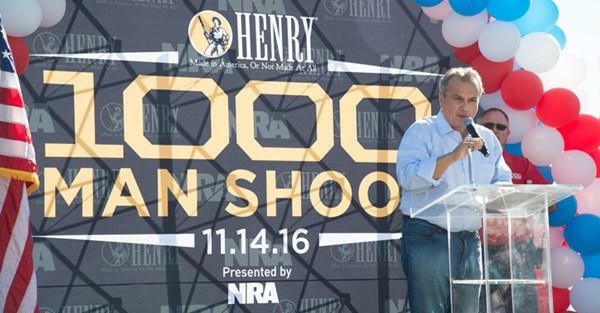 The record-breaking event was a combined effort between Henry Repeating Arms and the NRA. Henry donated the 1000 commemorative .22 LR rifles. One million dollars is expected to be raised. All proceeds will support NRA initiatives, including Firearms Safety, Youth Shooting Sports, Disabled Shooting programs, Child Safety programs, and NRA efforts to protect Second Amendment rights. Pete Brownell, first VP of the NRA and CEO of Brownells Inc., said the 1000-Man Shoot served as a statement that Americans would stand up for their freedoms: “As some of you may know, we made history last week,” Brownell told the crowd. Then he encouraged participants to go out and make their own history with the record-setting shoot. Another 1000-Man Shoot in the Future? 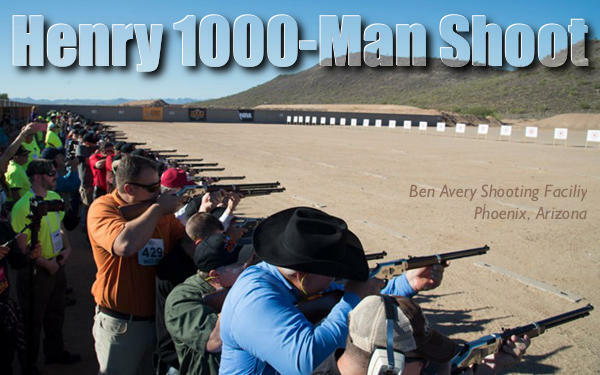 Share the post "Henry 1000-Man Shoot Is Big Success in Arizona"
The NRA (with help from Smith & Wesson) has created a compelling video explaining how and why women use firearms for hunting, sport, and self-defense. The video features many of our friends, including pistol champion Julie Golob and ace 3-Gun competitor Maggie Reese. 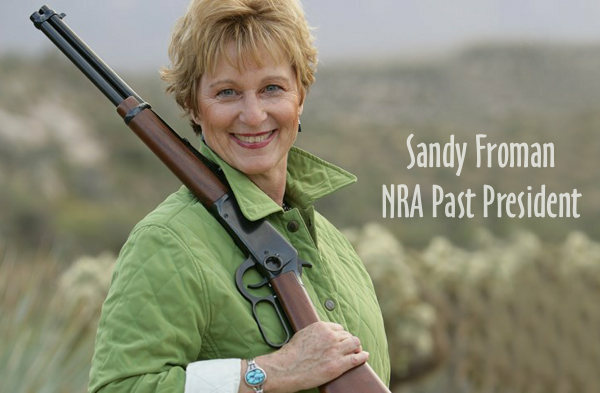 The video spotlights women who value their Second Amendment rights, understanding that a firearm remains the “great equalizer”, allowing women to protect themselves and their families. The video challenges the anti-gun politicians and media “talking heads” who want to disarm women: “These authorities that I’ve never met, they’ll never know me, they’ll never know my circumstances, they’ll never know what I’m up against”, says Natalie Foster. “So many things can change when we start losing our civil rights, and our most basic civil rights of self-defense.” — Julianna Crowder. 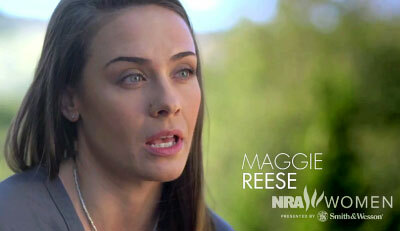 Share the post "NRA Video Focuses on Women’s Firearms Rights"
The 31st Annual Gun Rights Policy Conference (GRPC) will be held in Tampa, Florida this weekend, September 24-25, 2016. This important annual conference offers two days of panel discussions and presentations guided by leading figures in the firearms community. More than 75 speakers will cover a wide range of topics, including the upcoming November elections, state legislative activities, working with the news media, and general Second Amendment issues. Those who can’t attend the 31st Gun Rights Policy Conference in Tampa this weekend can still “listen and learn”. The GRPC will be live streamed on the conference days – September 24 and 25, 2016. 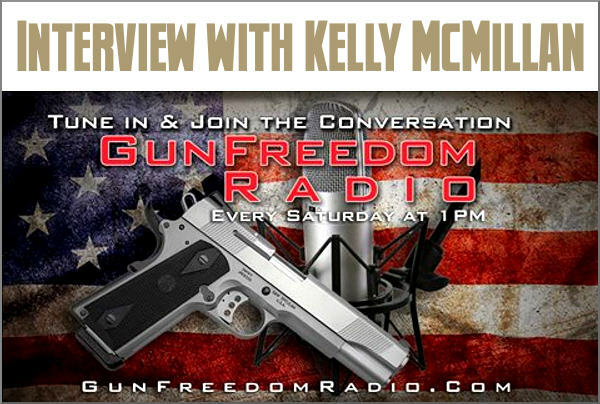 All Americans interested in Gun Rights and the Second Amendment can watch and listen anywhere there is an internet connection. Here are links for the live streams this weekend. CLICK HERE for Saturday, Sept. 24 LIVE STREAM | CLICK HERE for Sunday, Sept. 25 LIVE STREAM. NOTE: Be sure to check the 2016 GRPC Agenda to ensure you won’t miss the most important discussions and presentations. Among the speakers at the GRPC will be Virginia attorney Alan Gura, who argued both the 2008 Heller case and the 2010 case of McDonald v. City of Chicago before the U.S. Supreme Court. Gura will be joined by Alan Gottlieb, founder of the Second Amendment Foundation (SAF); Professor John Lott, author of The War on Guns and a Fox News.com contributor; Tom Gresham, host of nationally-syndicated Gun Talk radio; and self-defense authority Massad Ayoob. 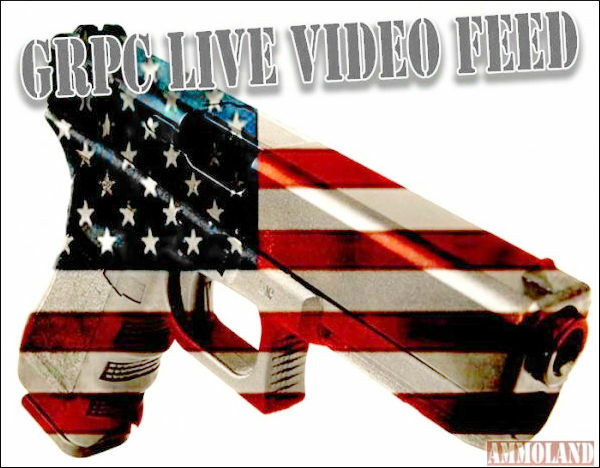 AmmoLand Shooting Sports News will be sponsoring and hosting the LIVE VIDEO feed of the 2016 Gun Rights Policy Conference. Watch it online Sept 24 & 25th 2016. Share the post "Gun Rights Policy Conference this Weekend in Tampa, Florida"
We uphold the right of individuals to keep and bear arms, a natural inalienable right that predates the Constitution and is secured by the Second Amendment. Lawful gun ownership enables Americans to exercise their God-given right of self-defense for the safety of their homes, their loved ones, and their communities. We salute the Republican Congress for defending the right to keep and bear arms by preventing the President from installing a new liberal majority on the Supreme Court. The confirmation to the Court of additional anti-gun justices would eviscerate the Second Amendment’s fundamental protections. Already, local officials in the nation’s capital and elsewhere are defying the Court’s decisions upholding an individual right to bear arms as affirmed by the Supreme Court in Heller and McDonald. We support firearm reciprocity legislation to recognize the right of law-abiding Americans to carry firearms to protect themselves and their families in all 50 states. 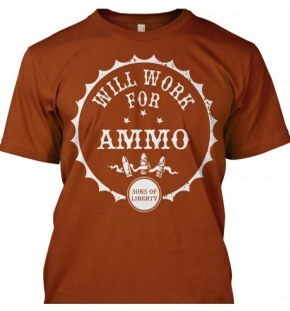 We support constitutional carry statutes and salute the states that have passed them. We oppose ill-conceived laws that would restrict magazine capacity or ban the sale of the most popular and common modern rifle. We also oppose any effort to deprive individuals of their right to keep and bear arms without due process of law. guns to known violent criminals. 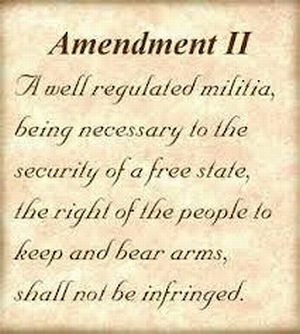 Share the post "GOP 2016 Platform on Second Amendment and Gun Rights"
If you are a gunsmith or work on firearms, you need to read this carefully. The Federal Government, acting through the Department of State Directorate of Defense Trade Controls (DDTC), has imposed significant new burdens on gunsmiths by expanding the definition of “manufacturing”. 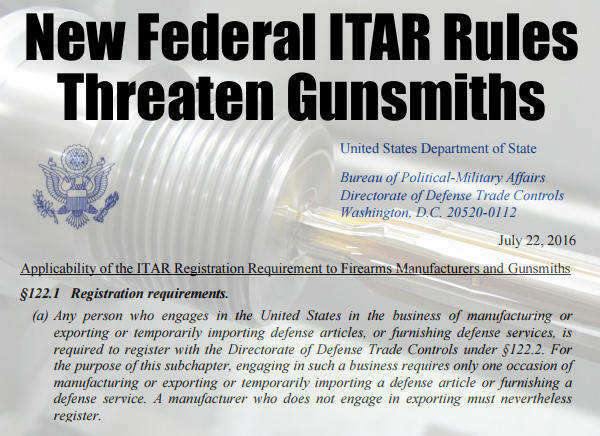 This is a big deal, as the Arms Export Control Act (AECA) and its implementing rules, the International Traffic in Arms Regulations (ITAR), require firearms “manufacturers” to register with DDTC and to pay a registration fee that (for new applicants) is currently $2,250 per year. Previously, most small gunsmithing operations that did not export firearms were NOT subject to AECA/ITAR registration requirements. Now, by virtue of a DDTC “Guidance” ruling issued 7/22/2016, ordinary gunsmiths might be required to register as a manufacturer simply because they thread a muzzle or cut a chamber. The NRA-ILA states: “DDTC is labeling commercial gunsmiths as ‘manufacturers’ for performing relatively simple work such as threading a barrel or fabricating a small custom part for an older firearm. Under the AECA, ‘manufacturers’ are required to register with DDTC at significant expense or risk onerous criminal penalties.” Read NRA-ILA Full Report. h) Blueprinting firearms by machining the barrel. Editor’s Comment: Does this mean that any stock-maker or stock supplier is an ITAR “manufacturer” under part 2(c)? Would installing a scope or accessory rail fall under part 2(a) as “equipment upgrading”? Would fluting a barrel be considered “manufacturing” under part 2(h)? (a) Any person who engages in the United States in the business of manufacturing or exporting or temporarily importing defense articles, or furnishing defense services, is required to register with the Directorate of Defense Trade Controls under §122.2. For the purpose of this subchapter, engaging in such a business requires only one occasion of manufacturing or exporting or temporarily importing a defense article or furnishing a defense service. A manufacturer who does not engage in exporting must nevertheless register. Barrel chambering image from Primal Rights, dealer for Desert Tactical Arms. Share the post "ALERT: Feds Impose ITAR Registration Burdens on Gunsmiths"
The National Shooting Sports Foundation (NSSF) #GUNVOTE program is an important voter registration and education campaign for the November 2016 election. The NSSF’s Gunvote.org website helps visitors register to vote, find a polling place, and determine how candidates stand on gun rights and Second Amendment issues. Quickly find all state and federal candidates in your area with a Zip Code search (or you can search by name). The NSSF’s #GUNVOTE program also provides election news, voter education video resources, and more. 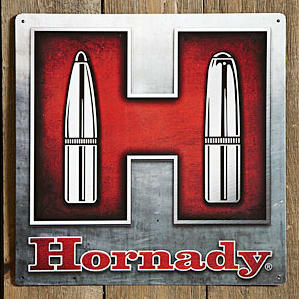 To assist the NSSF’s voter registration and education efforts, Hornady Manufacturing has committed $250,000 in support of #GUNVOTE programs. 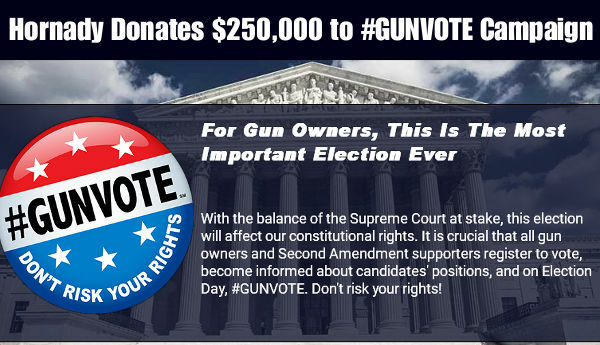 This is the largest donation the #GUNVOTE campaign has received to date. Share the post "GUNVOTE Program Promotes Voter Registration and Education"
Referring to its landmark 2008 D.C. v. Heller ruling on handguns in the home, the justices said the Second Amendment applies “to all instruments that constitute bearable arms,” even those not in existence at the time of the founding. The unsigned opinion is very short[.] Alito writes a much longer and more forceful opinion in concurrence. It could, and should, have gone much further. None the less, it is an enormous win for Second Amendment supporters, and it extends far beyond stun guns and Massachusetts. There is strong language in this opinion. If 200,000 stun guns in the U.S. are “common”, it is hard to believe that 5 million AR-15s and millions of other semi-automatic rifles are “unusual”. The case lays to rest the idea that courts can simply say anything other than handguns are “uncommon” or “unusual” and are therefore exempt from Second Amendment protections. This case will be cited far into the future. 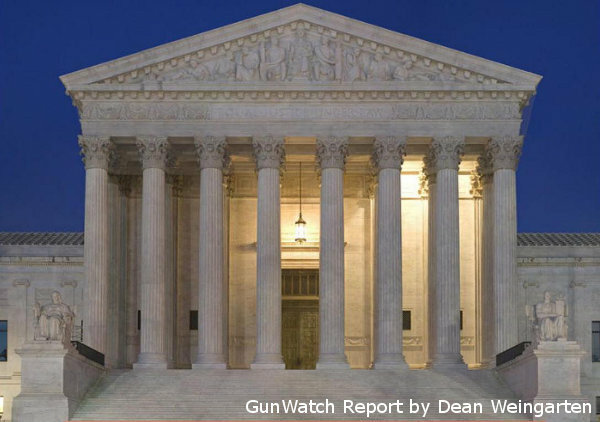 Share the post "U.S. Supreme Court Confirms Broad Scope of Second Amendment"
Appeals Court Remands Decision for ‘Strict Scrutiny’ of Second Amendment Issue. Earlier this week, the U.S. Court of Appeals for the Fourth Circuit overturned a Federal District Court decision finding the 2013 State of Maryland Firearm Safety Act (FSA) to be constitutional under “intermediate scrutiny” review. In the Case of Kolbe v. Maryland, the Appellate Court held that Maryland’s FSA should, as a matter of law, be subject to “strict scrutiny” under the Second Amendment of the U.S. Constitution. The Kolbe v. Maryland case was filed to challenge Maryland’s 2013 ban on so-called assault weapons and high-capacity magazines. The [Appellate Court] vacated the District Court’s denial of the plaintiffs’ claims and remanded the case to the lower court, ordering that it apply the appropriate strict standard of review. Share the post "Maryland Gun Law Ruling — ‘Strict Scrutiny’ Should Apply"
Sturm, Ruger & Company, Inc. has pledged to donate $2.00 to the NRA for each new Ruger firearm sold between the 2015 and 2016 NRA Annual Meetings, with the goal of giving $4,000,000. 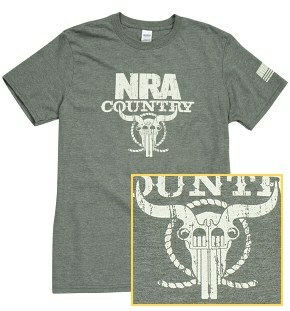 Ruger’s donation will benefit the NRA Institute for Legislative Action (NRA-ILA). For more details about the 2015-2016 “2 Million Gun Challenge” and to track its progress, visit Ruger.com/2Million. 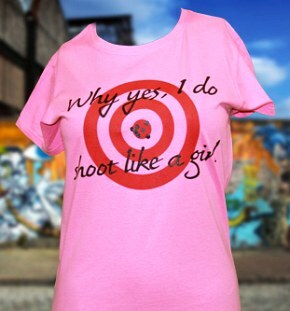 To learn more about Ruger firearms visit Ruger.com or Facebook.com/Ruger. Share the post "Ruger’s “2 Million Gun Challenge” to Benefit NRA-ILA"